Just revisited: 'Harry Potter & The Order of the Phoenix' — Sorry, Internet. RIP to our dude sirius black. My re-read of the Harry Potter series is prompted by the podcast Binge Mode, in which Mallory Rubin and Jason Concepcion are deep-diving into each book one by one. Matching the format of their shows, I’ve been choosing a theme in each blog for each book. For Stone it was joy, for Chamber it was duty, for Prisoner it was kinship, for Goblet it was division, and now for Order it will be growing pains. Many people, even diehard HP fans, don’t really love Order. It’s the longest book in the series and a lot of time is spent getting the inside scoop on Harry’s whiny teenage thoughts. Throughout this story, Harry often complains about being kept out of the loop when it comes to the Order of the Phoenix’s inner workings, and he laments that Dumbledore, someone he looks up to as a true mentor and hero, doesn’t seem to be interested in his help and won’t even talk to him. This is not just disheartening, but a genuine shock — only a few months earlier did Harry witness first-hand the rebirth of Lord Voldemort and team up with Dumbledore to share the story with the wider wizarding community. Harry rightfully expected to be a key cog in Dumbledore’s plans this year. The end result is not the most pleasant read for long stretches of time. Harry is whiny here — a character trait that is difficult for many readers to overcome. Stories we’ve read in the past tells us that the hero of our story shouldn’t be like this; he should look for ways to defeat adversity and triumph. But while I may not love reading these stretches of Harry’s inner monologuing, and while Order wouldn’t top my list in terms of most enjoyable end-to-end reads, I do respect the general choice of character direction from J.K. Rowling. Harry is 15 years old in this book, which is pretty much the exact wrong age to do anything. You’re a bit too old to be bossed around and babysat by The Adults all the time. You’re certainly too young to be super involved in important decision-making; Harry, as exceptional as he may be, is never really the master planner behind the scenes through these stories. While he’s a great leader at times, he’s much more the player than the coach, essentially executing a plan that Dumbledore has been working on for nearly 20 years; to Harry’s credit, his following his own moral compass to make the right decisions (or at least decisions that are right enough) is crucial to this plan. The other problem with being 15 is that you definitely think you know enough to do it all yourself, or at least help with the doing of it all. The more skilled and experienced people around you may recognize how good you are at a thing, but they’re never going to completely hand the keys over. Mix this with the general anxiety that comes with this age and you’ve got a primo recipe for Harry to be an extremely whiny teen. That Rowling chooses to slog through all this so we can experience Harry’s character development firsthand is a good call, I think. If you don’t see Harry suffer through moments like these, it’s quite a bit too easy to forget that he’s 15 years old. It lessens the magnitude of just how impressive some of his accomplishments are throughout the years. It turns him into a superhero of some type — a young person who is apparently impervious to any growing pains and is blessed with being able to adapt to any situation, able to learn any new skill, able to succeed in the most clutch moments without paying dues. This aren’t the definable qualities of Harry as a character, so of course we see him at his whiniest and most selfish moments — they’re part of what make him the person he is, and no one knows Harry better than the reader does. All that said, Harry’s specific (whiny) coming-of-age storyline is only a part of the larger picture we get of many growing pains throughout this movie. The Order of the Phoenix has been called back into action by Dumbledore following Voldemort’s return to power, and the organization has its own growing pains to content with. Some of the original members of the Order are still around (like Mad Eye Moody, Sirius Black and Remus Lupin, Dumbledore himself along with Minerva McGonagall, and others), but plenty of folks are new this time around. Severus Snape is a full-on member this go-round, and that alone causes strife between certain members of the group. Overall, it’s an astonishingly small core group that Dumbledore has assembled, when you consider the task at hand. The rest of the wizarding world is discounting the story of Voldemort’s return that Harry and Dumbledore are putting forth as the truth. The newspaper is writing stories to discredit the pair of them nearly daily, and as a result each of them are facing constant doubters on an everyday basis. For Harry, this manifests in hallways even in his own dormitory room. It requires a steady force of will for Harry to maintain his truth-telling in the face of the constant negativity. Many of the common wizards discounting Harry and Dumbledore are doing so due to the Daily Prophet’s common attacks on the pair, but the Prophet itself is taking its cue from the Minister of Magic, Cornelius Fudge. He commonly refuses to believe Dumbledore, instead getting it in his head that Dumbledore is out to take his job and assume a position of greater power in the world. Fudge struggles — or plainly refuses — to grow into a position of leadership over the course of this year. “Growing pains” is too nice of a phrase to describe this type of recklessness and selfishness in Fudge’s position, especially when you consider Dumbledore gave this dude the gameplan he should follow immediately after Voldemort’s return. Dumbledore himself is going through some growing pains as the “manager” of the good guys here. He hasn’t fully grasped how he should be handling Harry; in this chapter, he’s still treating him as too much of a child. Part of this is simply the awkwardness of Harry’s age, but Dumbledore’s failings in this book ultimately lead to the events that trigger the battle in the Ministry and Sirius’ death. His failings do also lead to the best and most satisfying version of the “Dumbledore explains everything to Harry in a nice little recap” conversation at the end of the book. Speaking of Sirius, and earlier about the Order, the “growing pains” term might most appropriately apply to him. His inability to help the cause in the way he wants drives him crazy and makes him take unnecessary risks. 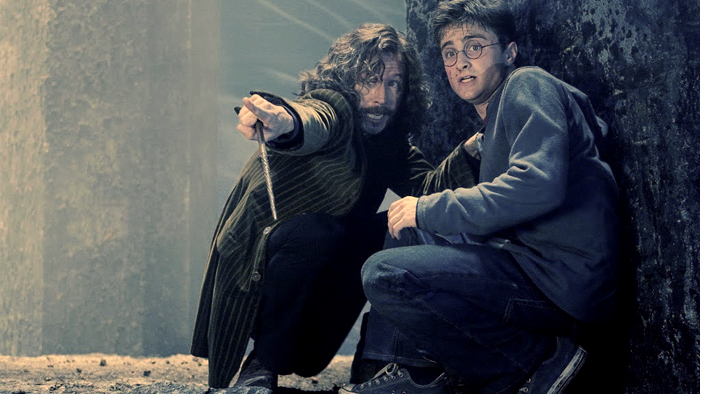 The extent to which Sirius is unhappy in the final year of his life is certainly tragic, but at the same time, you do wish as a reader that Dumbledore would have found a way to manage his discontentment a little better. It’s tough to pin this all on Dumbledore, though — the dude is a busy guy. The growing pains apply fully within the walls of Hogwarts as well. Ron and Hermione have to learn to accept new roles in the cause, including becoming Hogwarts Prefects this year. Hermione does this with grace, prodding Harry to begin Defense Against the Dark Arts lessons with Dumbledore’s Army and helping him grow into a position of slightly more formal leadership. Ron stumbles with this in parts, as we’d expect from his character, but altogether he isn’t nearly as out of it in Order as he was in the first half of Goblet. Still within the walls of the school, Dolores Umbridge has an extraordinary time grappling with the power she gains and the power she doesn’t gain throughout this semester. It’s clear she wants to rule with an iron fist, but that’s tough to do when you don’t have a loyal following — the Hogwarts staff skirting her orders or refusing to help her when she could use a hand provide some of the most satisfying moments in Order, including the high-flying escape of Fred and George Weasley, but it must be a maddening time from Umbridge’s perspective. We don’t often look at villains in this sort of way, and Umbridge is arguably the most vile villain in the entire sage for me, but it’s an interesting angle to think about. Similarly, we don’t necessarily ever evaluate these events from Voldemort’s perspective. He’s hiding out somewhere, counting on his loyal-to-a-fault Death Eaters to execute his plans. But aside from a couple extremely talented witches and wizards, his Death Eaters are pretty bad at their jobs — talk about a bad look to not be able to take out a bunch of teenagers in the Ministry. This must drive him batshit crazy considering he knows his smartest move is to stay out of public light. When he does finally show his face, he’s quite soundly outperformed in a duel by Dumbledore. All this analysis does cloud the broader point — which is that Order is still a super satisfying read. It’s not the book I would pick out of the lineup to read on its own for purely entertainment value, but the emotional payoff at its conclusion is incredible. It’s yet another triumph in plotting and foreshadowing on JKR’s part, and certainly a sound contender for the best book in this saga. The movie version of this … leaves a bit to be desired. The thestral flight and the battle at the Ministry are good; the duel with Voldermort and Dumbledore is great, which is a relief because that’s one thing you don’t wanna mess up in this depiction … but overall, it’s just an OK entry into the film saga. Can’t really blame them, with such a huge book to cover and so much of it reliant on Harry’s internal monologuing. Harry Potter & The Order of the Phoenix is available on Amazon in e-book, hardcover, and paperback editions. It's also available on Audible; if you click this link, you can get a free trial of Audible that includes two free audiobooks. Even if you cancel your trial, you'll get to keep these two books. Also: clicking on any of the Amazon links in this post, and purchasing something from them, provides a small percentage kickback to the author of the blog you just read.